Getting all that Cordray Farms Beef ready requires working all year long. This fact was brought to my attention the other day when someone asked what we do in the off season and I said we raise cattle and sell farm raised beef. They replied, "That must be great, 'cause all you really have to do is watch 'em, right?" I'm going to try to share with you on what goes into raising the cattle that make up the beef that's on your plate! Our soils require fertilizer to give the grass the nutrients. 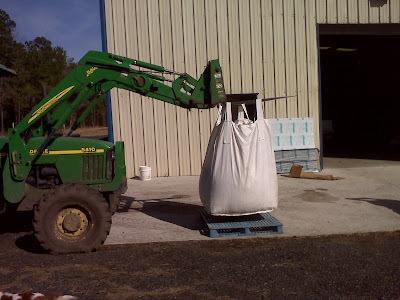 It's a mixture of nitrogen, phosphorus, and potassium that the soil samples we send off determine ours soils need. It comes in little white granules in these big cloth bags. It's a lot like a giant purse! For best results, the fertilizer needs to be put on the grass before a light rain. 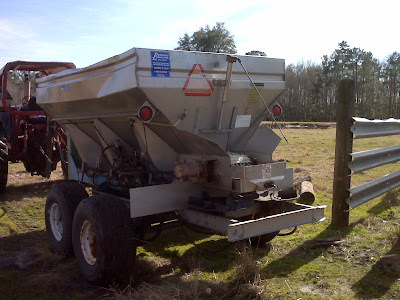 So last week, Michael filled up this spreader and went to work! See the little round plate at the back? The little granules fall on there and get tossed all over as it spins. Don't walk too close, they really sting! Cordray's has 500 fans on Facebook! It's been fun having the Cordray's Facebook page. Today we reached 500 fans! If you're not a fan, click on the link in the right sidebar and join us! Thanks to everyone! What ever happened to the chickens? If you're a longtime blog viewer, you may remember last year's free range chicken experiment in the off season. We hatched baby chicks and watched them grow over the summer. The idea was that I'd sell fresh eggs in the shop once deer season started. It didn't exactly work. The hawks and foxes around here made off with quite a few chicks and it was well into the season before they were laying well. So I bought a flock of Rhode Island Red pullets - half grown teenager types. They've done great, but I've never gotten enough eggs to have spares to sell. I've been giving them away and we're getting good at egg salad! I plan to get a few more hens this spring and try again. 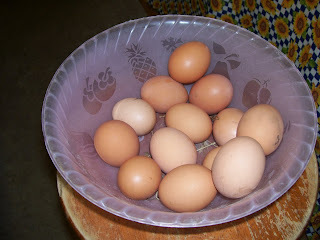 This is about how many eggs I get in 2 days. I plan on trying it all again, but this time building a chicken house to keep them safe at night. Newsflash: A Cordray Farms Beef Side is awaiting your cutting order! We've got one Beef Side available. We'd reserved one for a customer who changed their mind. So before we cut it into the standard cuts for a share, I thought I'd check with all of you to see if we can do a custom cut Side for you. If you've gotten a share before, it is the equivalent of 4 shares, but packaged according to your special instructions. For instance, you might want more burger patties, rather than bulk, or 2 inch thick steaks and larger roasts sized for a family of 6 or that standing rib roast for Easter dinner. We'll take detailed instructions from you on just how you want every piece handled, then freeze it in family sized portions for your freezer. Beef sides are $3.25 per lb. (precut weight) and thus average about $1000 for the complete Beef Side. This Side will be cut next week regardless. Call today to reserve this Side! Getting political for our pets! We're excited to support a new bill that has been introduced in the State Legislature this year by Sen. Glen McConnell. It's labeled S. 1032 and says that we can sell certain parts from deer as dog food. If it passes, it will allow all the venison processors who are inspected by the state Meat Inspection Service to be able to make use of all the good protein that we throw away and provide a nutritious local food for our dogs and cats. Right now the bill is in the Agriculture and Natural Resources committee, chaired by Sen. Verdin. We'd really appreciate any efforts on your part to contact the members of this committee and encourage them to support this bill. To me, it just seems sensible that we make use of this resource instead of throwing it away! Follow this link to see the members of the committee and access their telephone numbers and emails. We'll keep you posted on the progress and, hopefully, let you know when you can buy venison parts for your pets! Cordray's Taxidermy hard at work! 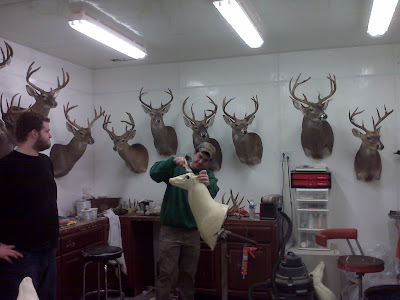 Now that deer season is over, Kenneth's working on getting all those mounts finished. This photo shows him under the watchful eyes of the Class of 2009! When yours is complete, we'll be giving you a call.